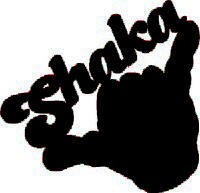 Shaka w/ Word 4" x 3.5" Laser Cut. A perfect scrapbooking embelishment for all your tropical and Hawaiian memories and adventures! Approximately 4" x 3.5"